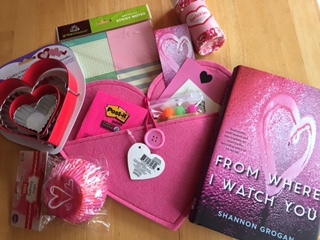 My MC Kara is a baker and she thinks winning a Valentine’s baking contest will help her escape life, so in honor of Kara, I’m giving away a hardcover copy of From Where I Watch You, baking treats, and writerly treats! Enter a comment here, or Twitter, Tumblr, Instagram (@Shannywriter) or Facebook (Shannon Grogan). RT’s and shares get you another entry! Ends noon on February 14th! Good luck and thanks for entering!